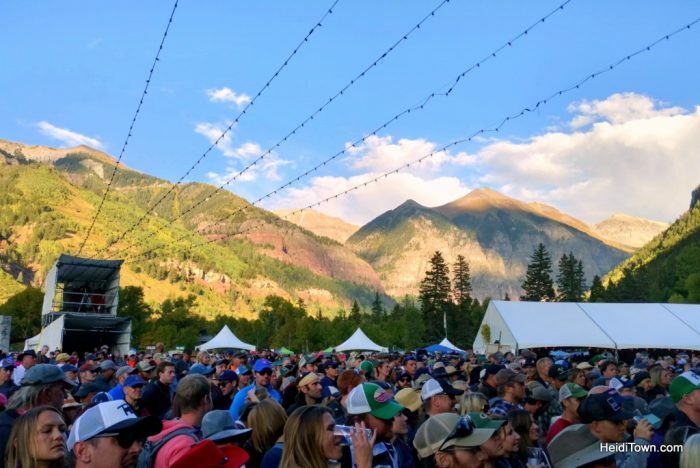 I don’t always write a festival recap, but after returning from an outrageously fun weekend at Telluride Blues & Brews, I thought a review was in order, especially since I know some of my readers have contemplated attending this event, but haven’t done so yet. Ryan and I sailed into Telluride at 4 p.m. on Friday. 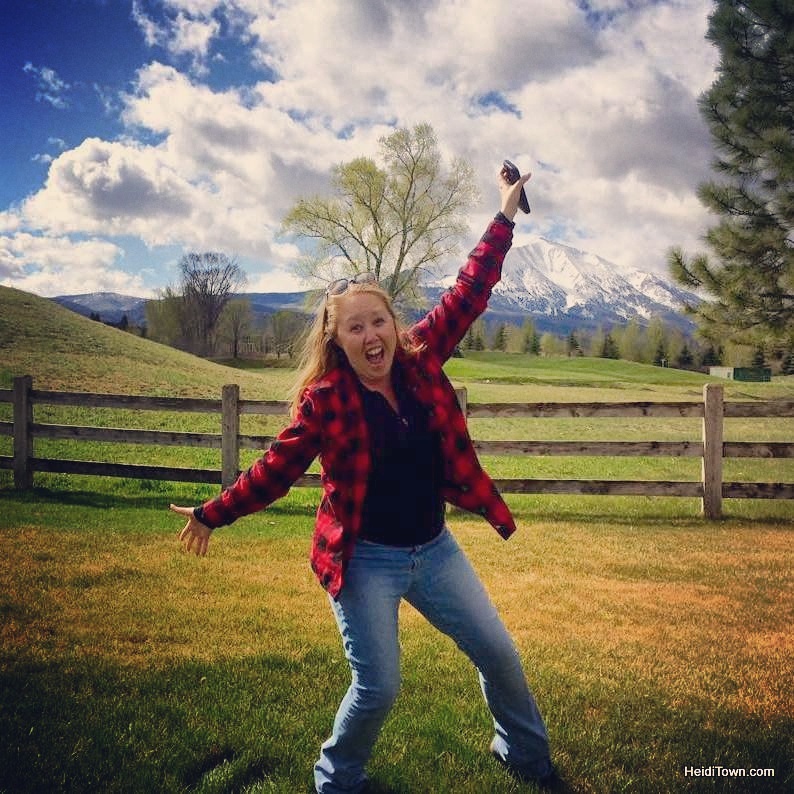 We checked into Peaks Resort & Spa, my favorite hotel in Telluride, and boarded the gondola. 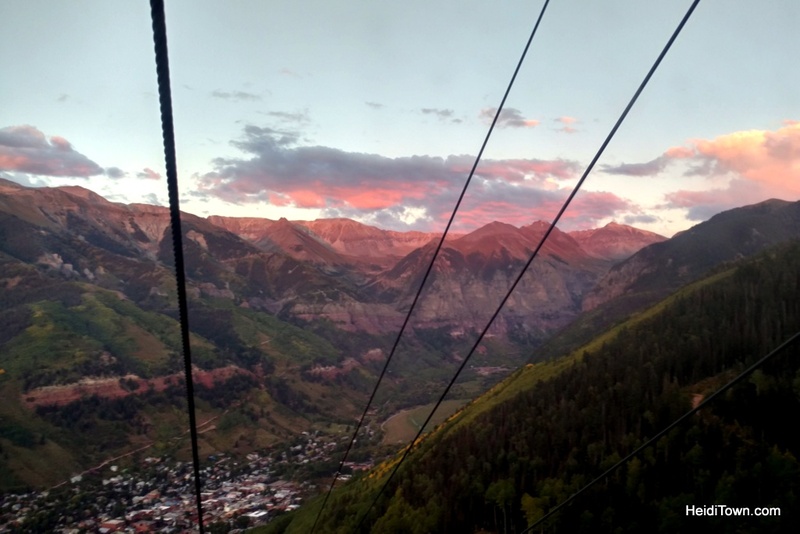 Since we were staying in Mountain Village and Telluride Blues & Brews is in town park, we rode the gondola a lot during our 3-night stay, which resulted in a few stories. The free gondola runs between Mountain Village and the town of Telluride, and I’m well acquainted with it. I love this gondola ride because 9 out of 10 times, I engage in a fun conversation with other riders. I think this gondola inspires conversation because at 15 minutes in length, it’s just long enough that people start to feel comfortable with the strangers around them. On this trip, we rode with all sorts of people – some were in town for Telluride Blues & Brews, while others were passing through, like a retired couple from Texas Hill Country who told us delightful stories about their travels across the United States. After midnight, we rode with a guy from the festival’s sound production crew who is in a Denver metal band with a name I can’t recall. He relayed to us that the night before he’d been on the gondola alone and belted out songs in the dark. He said it was an excellent place to practice. 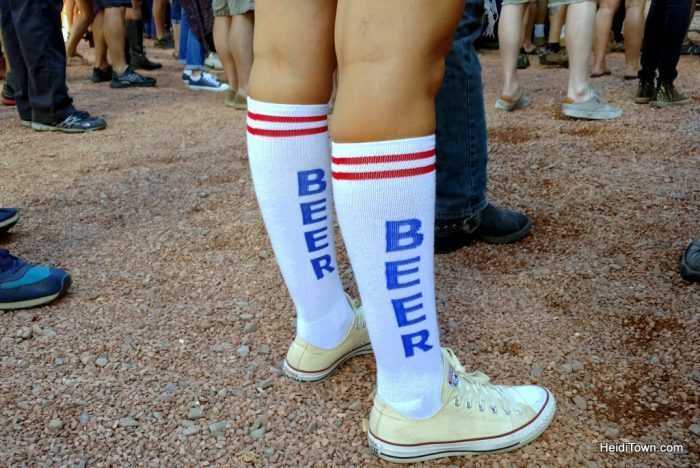 I’m not going to write up the entire play-by-play of this year’s Blues & Brews Festival, but I will tell you some of the highlights. Musically, it’s a blues fest, but don’t expect every musician to be super bluesy. We were happy about this as blues music isn’t our first love. 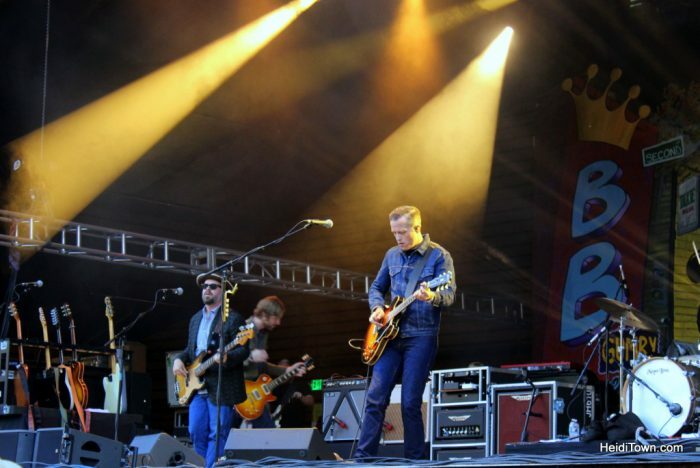 Jason Isbell played Friday evening and he lived up to our expectations. We’re longtime fans and have all his albums on vinyl. On Saturday evening, we caught the end of headliner Gary Clark Jr.’s performance and then stuck around for the late night Juke Joint show on the Blues Stage (a smaller, inside venue on the festival grounds). Catching a juke joint show at Telluride Blues & Brews rounds out the experience because it’s chance to get a more intimate experience with the musicians. These late show take place at various venues around Telluride. Other musical highlights included Vintage Trouble, who in my opinion, nearly stole the whole show, and the Mick Fleetwood Band featuring Rick Vito. I loved every second of their upbeat set. Non-musical highlights at Blues & Brews included spending some time in the VIP section on Sunday. As the Broncos’ biggest fans, we never miss a game, and were pleased to discover that the VIP section included a sports bar area with multiple televisions. That was a win/win for us as it meant we didn’t have to leave the festival to watch the game. I was super impressed with the food selection at Telluride Blues & Brews, and had a good-enough-to-write-home-about gyro on Saturday. The food selection at Blues & Brews is several steps above county fair festival food, and I think even a confessed foodie would have been happy with the selection. The Grand Tasting beer event on Saturday was crowded, so don’t go to this festival thinking you’re going to get quality time with the brewers, although I did run into a few around town. However, we enjoyed tasting a few craft beers from Arizona, because we seldom see breweries from the Grand Canyon State at Colorado beer festivals. 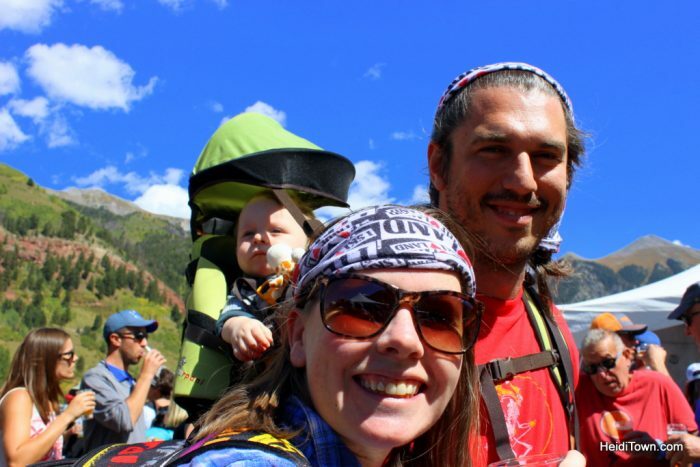 While we’re far from being festival newbs, Ryan and I don’t do a lot of 3-day music festivals, so we weren’t properly prepared. Next year, we’ll bring chairs and stake out some festival territory so that we have an area to sit down and eat, etc. Also, while this year’s weather was fantastic – not one raindrop fell – this fest usually comes with a little rain, so we’d pack rain gear. Lastly, I would have packed a heavier jacket instead of sweaters. September nights in Telluride get downright chilly. Thank you to Telluride Blues & Brews Festival and Telluride Ski Resort for hosting us. I can’t wait to experience this event. Oh, my list is getting long Heidi!